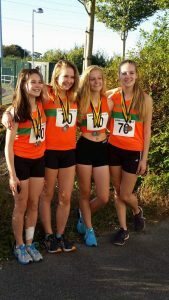 WOKING Athletic Club’s under-17 girls’ 4 x 100m relay team set two new club records – and came away with two medals at last weekend’s [10-11 September 2016] Surrey County Relay Championships in Carshalton. It was an incredible feat for Amy Braid, Freya Challis, Emily Read and Amy Brown, who are now ranked in the Top 15 club relay teams in the country. More impressively, three of the four girls still compete in the younger under-15 age group. Braid got the team off to an outstanding start, before handing the baton over to Challis who ran a very strong second leg. Read linked up well with Challis to run an impressive third leg, leaving Brown to sprint past the line in a time of 50.1 seconds to claim bronze. The time was 0.3 seconds inside the Woking girls’ own club record, and 0.26 seconds behind second place Herne Hill Harriers AC. Guildford & Godalming AC won the 4 x 100m relay in a time of 48.49. The same quartet almost went one better in the 4 x 300m, which saw the girls narrowly miss out on a silver medal after dropping the baton on the second changeover. Despite the mix-up, all four Woking athletes were rightly proud of their achievements, and have the potential to move up the UK rankings from future race meetings.